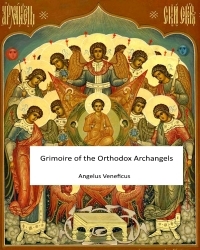 This Grimoire is not a work of traditional Ceremonial Magick, but a grimoire of religious practice in order to contact theaArchangels of the Orthodox Religions. There are no spells, incantations, only an effective method of invoking the power of the Orthodox Archangels in order for you to harness their powers, guidance and assistance. The instructions given for the invocation of the archangels does not follow any acknowledged Orthodox Church practices. Eastern Orthodox Tradition mentions "thousands of archangels; however, only seven archangels are venerated by name. Gabriel, Raphael and Michael, the other three are most often named Selaphiel, Jegudiel, Jeremiel, and Barachiel. This supports the ancient Hebrew Rabbis who always connected the seven Archangels with the seven then known planets: the Sun, the Moon, Mars, Mercury, Jupiter, Venus, and Saturn; and the Church has always thought and taught that God rules this Universe through his Celestial Armies or Angels. Currently there are three lists of these seven archangels. The first is detailed in the Book of Enoch, of the Ethiopian Orthodox Church, which itself is representative of the Oriental Orthodox churches. The second is from the tradition of the Chalcedonian Orthodox Church, which closely allies Gnostics listing, and finally, the third comes from St. Dionysius the Areopagite and Gregory the Theologian. All of these three different lists, however, agree on the names of the first three archangels: Michael, Gabriel, Raphael. The remaining four Archangels are more difficult to determine. The earliest reference to a system of seven archangels as a group appears to be in Enoch I (the Book of Enoch) which is not part of the Jewish Canon but is prevalent in the Judaic tradition, where they are named as Gabriel, Michael, Raphael, Uriel, Raguel, Remiel and Saraqael. To complicate matters further the Eastern Orthodox tradition venerates Gabriel, Michael, Raphael, Uriel, Selaphiel, Jegudiel, and Raguel.